When you are in the New Transaction screen, are the blue lights illuminated on the plugged in swiper? Try pressing back, unplugging the reader and plugging back in. Under Settings in the app, is Helcim Card Reader chosen? On the screen that says "Plug in the card reader", is the Credit Card Reader: ENABLED? 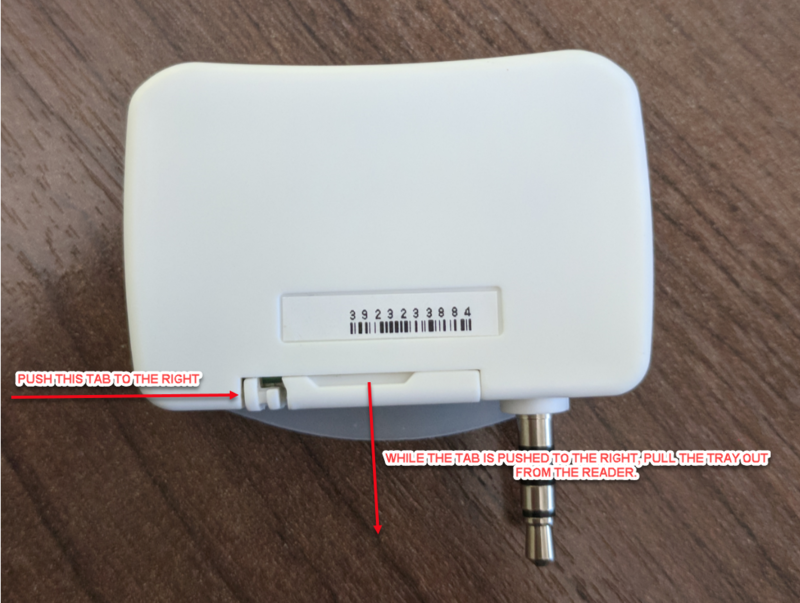 Is the switch on the side of the reader in the down position if you are looking at the reader with the audio jack pointed down? Is the volume on the phone/tablet turned all the way up? Does your microphone work through the audio jack? You can test this by inserting headphones that have a microphone and making a call/recording a voice note. Make sure you can both record your voice, and play it back through the headphones successfully. Is the card reader plugged in all the way? If you have a phone case, you may sometimes have to remove the case before plugging in the reader. Try pressing back, unplugging and plugging back in. Check for corrosion inside your headset jack. If you see a green color, that’s evidence of corrosion, and you may need to take your device in for service. You can find the battery at various retailers, including Amazon. If this does not solve the issue, please give our Support Team a call at 1-877-643-5246. If still unable to see the options to proceed, please contact our Support Team at 1-877-643-5246. Make a note of the device you are using. We need to make sure the device is running a supported OS (must be at minimum iOS 9 or Android 4 or later versions). Even if the barcode info has not been setup properly in the app, you should still get an error message. This indicates the scanner is connected but the product is not found. If the issue persists, please contact our Support Team at 1-877-643-5246.